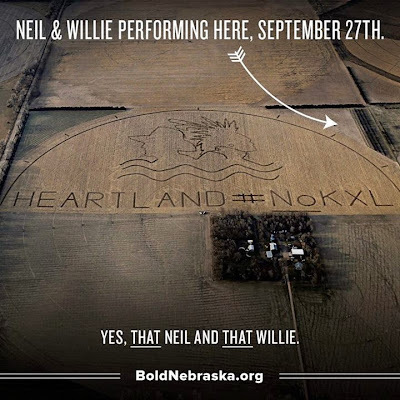 Willie Nelson and Neil Young will headline a concert in September in a Nebraska cornfield organized by opponents of a proposed pipeline that would carry oil from Canada south to the Gulf Coast. Tickets for the benefit concert will go on sale Wednesday, Aug. 20 online via BoldNebraska.org. 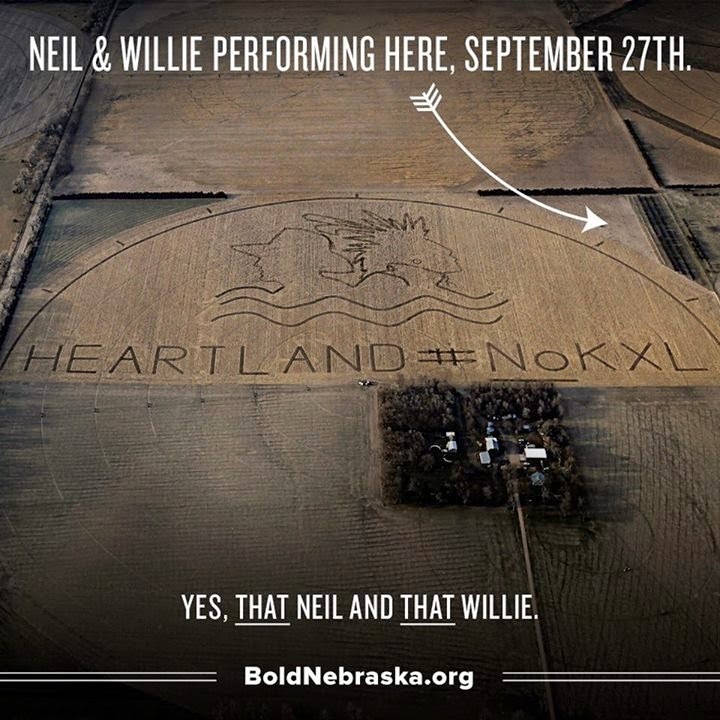 Neligh, Nebraska — Two music legends — Neil Young and Willie Nelson — will perform a benefit concert Sept. 27 on a farm near Neligh, Nebraska that is on the route of the proposed Keystone XL pipeline and also crosses the historic Ponca Tribe "Trail of Tears." 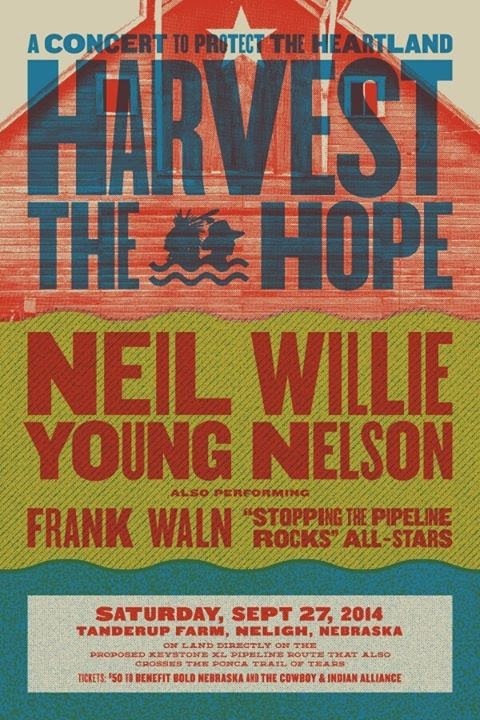 Proceeds from the "Harvest the Hope" concert will go to Bold Nebraska, Indigenous Environmental Network and the Cowboy & Indian Alliance, to fund the ongoing fight against the Keystone XL pipeline, as well as a number of small, community-based clean energy projects on farms and tribal lands. The daytime, outdoor concert will take place in a field on a farm owned by the Tanderup family, who are part of a strong collective of Nebraska landowners refusing to sell their land to TransCanada for the Keystone XL (KXL) pipeline. Art and Helen Tanderup are part of the "Cowboy & Indian Alliance," a group of farmers, ranchers and tribal members united in their desire to protect land and water, and in their opposition to the Keystone XL pipeline. This spring, the Ponca Tribe of Oklahoma partnered with the "CIA" to hand-plant several acres of sacred Ponca corn on the Tanderup farm — the tribe's ancestral homeland — where it will be harvested this fall for the first time since the Ponca people were forced out of Nebraska 137 years ago.Last fall, the same land also became home to the world's largest living crop art installation, when artist John Quigley collaborated with Art Tanderup to create an image the size of 80 football fields featuring the Cowboy & Indian Alliance icon along with the words "Heartland #No KXL." "Our family has worked this land for over 100 years. We will not allow TransCanada to come in here and destroy our land and water for their profit," said Nebraska farmer Art Tanderup. "The Heartland is more than a place, it's our home. We hope Americans from across the country join us to Harvest the Hope and stop the Keystone XL pipeline. ""Farmers, ranchers and tribes that have been standing up to TransCanada are rock stars in my eyes," said Bold Nebraska director Jane Kleeb. 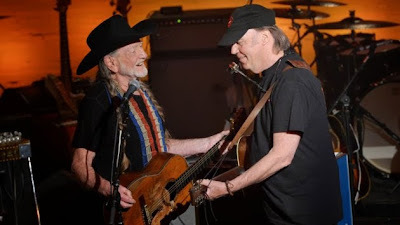 "Now we will have the honor to have music legends Neil Young and Willie Nelson stand with us against this risky pipeline that threatens our water and our livelihoods. It is our hope that Pres. Obama in the end stands with us over Big Oil. 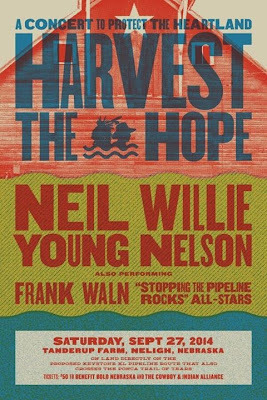 "In addition to sets from Neil Young and Willie Nelson, the "Harvest the Hope" concert will also feature performances by Frank Waln, a Native American hip-hop artist from the Rosebud Sioux tribe, and the "Stopping the Pipeline Rocks All-Stars," a collection of local Nebraska artists who performed on a benefit album recorded inside the clean energy-powered barn built by Bold Nebraska and volunteers on land directly in the path of the Keystone XL pipeline last year, near York, Nebraska.The event will also be a "Get Out the Vote" effort by Bold Nebraska, which is aiming to help elect candidates in November who give a damn about protecting our land and water. The "Harvest the Hope" concert is being produced locally by 1% Productions in partnership with Bold Nebraska. so much for all you have done and continue to do. You are aware that this oil WILL be going to India and China, whether through pipeline or any other means, right? You are aware it will be refined here right? This is a bad state to run this kind of fundraiser in... Warren Buffet is probably helping to sponsor it since he owns BNSF (the oil tanker fleet) and has a real vested interest in funding Obama to block Keystone XL all the while he makes more billions of dollars taking the same oil overland. Perhaps you folks don't connect the dots to Omaha, Nebraska with Warren Buffet. What a total sham?